Finding the best pot stocks to buy has become harder, as anticipation of further legalization has sent the shares of many marijuana companies soaring. The Horizons Marijuana Life Sciences Index ETF (exchange-traded fund) rose 74% from its debut in April through the end of 2017. And several individual pot stocks did far better last year. Aphria Inc. (OTCMKTS: APHQF) was up 292%, while Aurora Cannabis Inc. (OTCMKTS: ACBFF), for instance, rocketed 344%. It's getting harder to find winners in this segment – but not impossible. But one sector of the market in particular still offers tremendous upside for investors. Right now, the companies focused on the cannabis oil segment will be the best marijuana stocks to buy in 2018. Traditionally, people primarily consumed marijuana by smoking the plant, known as "flowers." But the trend toward legalization in the United States and Canada has opened the door to new options that offer more convenient, less conspicuous ways to consume cannabis. Concentrates and oils are easier to transport and easier to consume than smoking the flower form of marijuana. Plus, the oils lack the telltale odor for those who'd rather not broadcast their cannabis use to the world. Customers have taken to cannabis oils in particular. 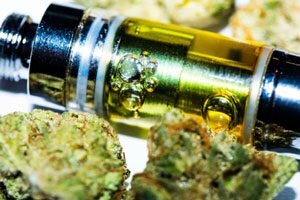 Oils can be ingested orally with a dropper or made into a capsule; they can also be vaped. That flexibility, in addition to its other advantages, has fed the popularity of cannabis oils. Sales of marijuana vaporizer cartridges in California soared 400% from 2015 to 2016, rocketing from just 6% of the market to 24%. 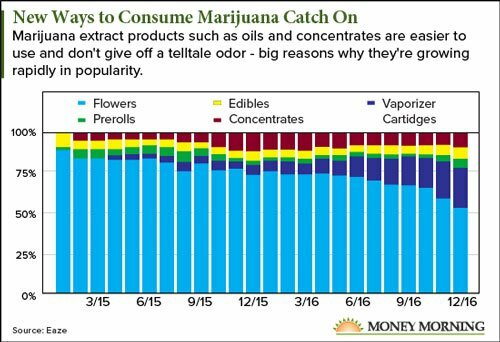 That makes cannabis oils a fast-growing segment of a rapidly growing market, fed by the trend toward legalization. Canada is expected to fully legalize marijuana this summer, while 29 U.S. states and the District of Columbia already have legalized some form of medical marijuana. And as if that wasn't enough, cannabis oils have healthier profit margins than other forms of marijuana. Canopy is the biggest cannabis grower in Canada and has been expanding its capacity. It's poised to be one of the major global players in the industry as marijuana legalization spreads to more countries. In addition to exposure to the blossoming Canadian market, Canopy already has agreements to export products to Germany, Australia, Spain, Denmark, Jamaica, Chile, and Brazil. The company is avoiding the United States for now, because marijuana is still illegal at the federal level. But if and when that changes, Canopy will be ideally positioned to jump on the opportunity. Canopy already has a foot in the door thanks to a $191 million investment from alcoholic beverage maker Constellation Brands Inc. (NYSE: STZ) last October. It's no coincidence that Constellation, which has a strong presence in California, made its move just months ahead of the state's full legalization of marijuana. Over the past year, Canopy has put more emphasis on its cannabis oils products, citing the higher profit margins of oils in its September quarter earnings report. Sales from oils increased 107% year over year, and the segment's contribution to overall revenue rose from 14% to 18%. The Brightfield Group estimates the global marijuana market will reach $31.4 billion by 2021. Should Canopy get 5% of the global cannabis market, it will grow sales by 250%. Even after considering one-year gains of 228%, that kind of a massive increase in revenue should boost the stock price substantially from the current $25.35. It would be easy to overlook Radient; it's small (the market cap is just under $300 million), and it's not wholly focused on cannabis. But it has a superior cannabis oil extraction technology that's already caught the attention of the No. 2 Canadian producer. The technology, which uses microwaves to extract oils from plant matter, is why Aurora Cannabis has made two major investments in Radient over the past year. In December 2016, Aurora invested $2 million in Radient as part of a joint venture to further adapt Radient's technology for cannabis oil extraction. Until that point, it was used to extract oils for the food, pharmaceutical, and cosmetic industries. Aurora followed up with an additional $12 million investment this past December. The appeal is that Radient's patented MAP (microwave-assisted processing) technology is significantly more efficient at extracting cannabis oil from hemp and marijuana. The company estimates MAP can reduce the cost of goods sold by 30% and boost gross margins by as much as 65%. Those gains hold true regardless of the type of biomass on which the technology is used. Any cannabis oil producer with access to Radient's MAP technology stands to be much more profitable. The agreement specifies that Radient will "deliver services under preferential terms to Aurora" for the five-year term of the deal. The additional business from an industry leader like Aurora will have a dramatic impact on Radient's revenue, which should drive Radient's profits and stock price higher. Radient stock currently trades at $1.27, so even a relatively small move could have a big payoff. And don't be surprised if Radient becomes an acquisition target, which could push the stock much higher. Radient's MAP technology is exceptionally attractive, and the company's relatively small valuation makes it affordable. Aurora already has established a reputation as an acquisitive company; that and its preexisting relationship with Radient makes it the most likely buyer. After following advice on buying pot stocks, my stocks were up the beginning of January. They have since turned the other way around and now I'm looking at double digit losers! We need a list of the weakest pot stocks so we can shift into the most likely winners. advise the reason? are investore are going out? we put a lot of money in marjunia stocks and are taking a beating what should we do? From 4/17-early 1/18 my aurora shares were up over 400%. They dropped to being up about 250% and I sold. Through which brokers we can buy these penny stocks at OTC. Please provide four names of such brokers. how do I invest in Canadian MJ stocks without a broker.Are there any Canadian co.'s that sell direct? Thanks Bruce. Well guys! I don't think it's fair to blame anyone hear as you are given choice through your decision on where your greed lies. No offence. I sold out last Friday. Warnings that the industry was over priced were everywhere. I lost a few bucks but nothing to worry about. I'm down in two years everything I've tried to invest to better my life but it's all backfired. I'm use to it but I won't believe I can't get it all back.one day. I'm just being patient and not panicking. The Marijuana stocks are dropping faster than a loose bowel movement after Ex-lax. So much for becoming a "Marijuana Millionaire!" great article about the pot stocks!! I want to also make profits from cannabis! Thank you so much for sharing this good news! Whoa! I'm looking for the best stock market for marijuana! Consolidation will start more rapidly in 2019. Avoid extremely speculative OTC stocks and invest in large companies with a big market cap.